NGC 1027 is an open star cluster discovered by William Herschel in 1787. It lies approximately 3000 light years away in the constellation of Cassiopeia, appearing between the famed Heart and Soul nebulae. The extremities of the Heart Nebula are visible in the upper right of the frame. 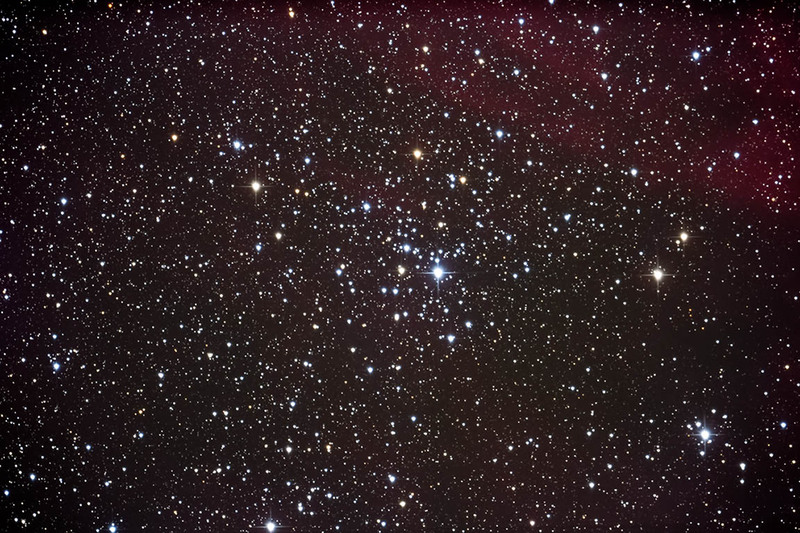 However, this star cluster is not associated with either nebula as it lies 3500 light years closer to us than they do. Also, the bright star at the center of the cluster is not associated with it. Images were focused using the camera's live view and a Bahtinov mask. They were converted in Camera Rawl and were aligned and combined in ImagesPlus. The final image was adjusted in Photoshop. Topaz Detail and DeNoise were applied. Taken from my backyard observatory in southeastern Minnesota on 10/29/18.